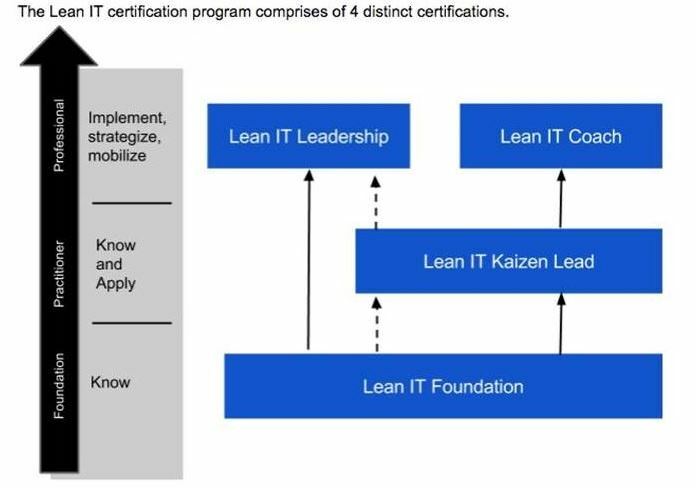 This Lean IT Kaizen Certification course is one of four courses included in the new Lean IT certification program defined by the Lean IT Association. The Foundation level course is a mandatory requirement for all other levels within the certification scheme. This course prepares you for the exam leading to the Lean IT Kaizen Certificate. This is a practical and hands-on 3-day course that teaches and equips individuals to define, facilitate and lead Lean IT Kaizen improvement initiatives. The course teaches students how to effectively use the Six Sigma DMAIC (Define, Measure, Analyze, Improve, Control) improvement model leveraging the Lean A3 problem identification and planning tool to complete a full improvement cycle. This certification course provides you with the knowledge, skills and methodology required to identify, plan and implement incremental service and process improvements focused on improving the efficiency and effectiveness of any process or value stream. This course prepares you for the examination leading to the Lean IT Kaizen Certificate. It is a 90 minute, 40 question, multiple-choice exam. You must attain a passing mark of 65% to attain your certificate. For traditional, live classroom and onsite presentations the exam is scheduled during the last day of class. For virtual online instructor-led courses you will receive an exam voucher to take the exam online any time after you have completed the course. The Lean IT Kaizen examination is administered and marked by APMG.